This cute little chicken can add a fun ornamental vibe to your kitchen decor, your office desk or your bedroom side table. She also has the added feature of being a stress toy, so you can squash and squish her and she will never get upset. You will get rid of all that pent up tension and feel a whole lot better. Stress toys are a must-have in this frantic life and our cute little chicken is waiting for you. She is made from a pliable material that returns to its original shape no matter how much she is squeezed or squashed. The fun design offers a sitting chick in a light colour. She has a bold bright face and crown on top of her head. A sunny coloured nose match with her feet and two dark eyes watch the world go by. 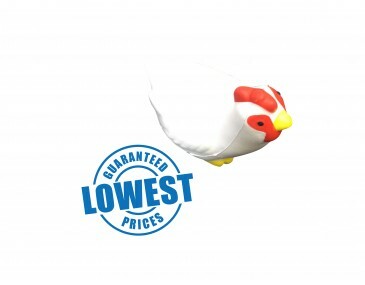 Let us help you create a great marketing campaign when you brand these chickens with your personalised logo and company graphics. Create a fun vibe at your next conference, seminar, expo or product launch when you hand out these stress toys to your clients as freebies. Companies in the dairy business, food industries and chicken industries will find that these toys are extremely meaningful and will add value to your advertising campaign. Our listed price includes branding of your logo or graphic in a single colour print onto the cow. Please note that our prices exclude GST and a print set up of $75 applies. This product is supplied in bulk quantities.